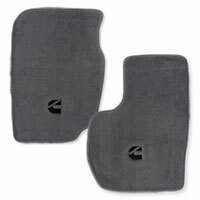 Add a touch of style to your '94-'02 Ram with a set of affordable Avery's custom-designed 'Cummins C' front floor mats. They are often larger and fit better than the OEM mats to ensure the best possible floor coverage. The embroidered Cummins "C" logo really stands out against the OEM colored mats.